When you decide to shop new cars, you’ll often be influenced by the commercials you see on TV – whether you’re aware of it or not. When it comes to car manufacturers, Subaru has done an excellent job recently of staying in the spotlight. Their commercials have appeared often on a variety of TV channels, and this year they’re highlighting safety and reliability – factors that are important for all drivers, but especially parents with children who are new drivers. Although perhaps not as sleek as Mercedes Benz or Hondas, Subarus do have a lot going for them. 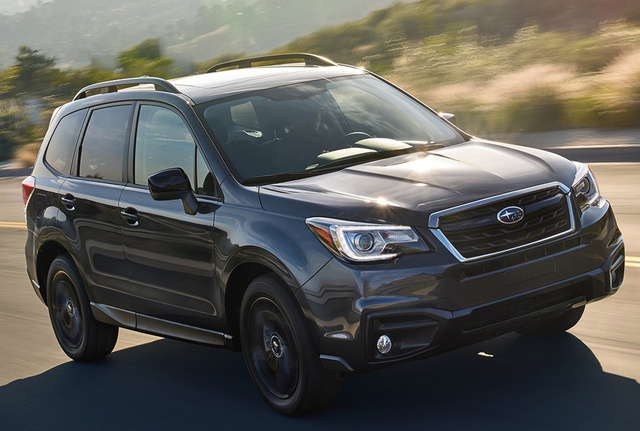 When you think Subaru, you probably think of the wagon style – but in an effort to be more appealing to a wider audience, Subaru does have a variety of models, like the one of focus today: the Forester. For the 2018 Forester, gas mileage is between 22 and 26 mpg for city driving, and 27 to 32 on the highway. A typical Forester will seat 5 adults, and the engine ranges from 170-250 horsepower. While the Forester may not be the fanciest of SUVs, its safety features and smooth driving are enough for many drivers, and the AWD is ideal for people who live in areas that see more rain, ice and snow. The 2.5i: The price for this model starts at around $22K. The gas mileage and engine are the same for all four models, but what does set the 2.5i back is that it does not have the panoramic power moonroof, leather trimmed upholstery, or a voice-activated GPS system. This model also does not come with the EyeSight technology mentioned above, or the reverse automatic braking (RAB). The 2.5i does, however, have break assist, tire pressure monitoring system (TPMS), keyless entry, and rear-vision camera. The 2.5i Premium: These models start at around $25K. Unlike the 2.5i, the Premium does have the panoramic power moonroof, an automatic climate control system, a STARLINK 7-8nch Multimedia Plus system, and STARLINK Safety and Security connected services. The 2.5i Limited: The Limited will set you back around $29,395. Features on this model include leather trimmed upholstery, auto on/off headlights, automatic climate control system, and blind spot detection. The 2.5i Touring: For this model with the most unique name, prices start at around $33,000. Upgraded features on the Touring include a voice-activated GPS system, keyless access with push-button start and PIN-code access, 2-position driver’s seat memory, a heated steering wheel, dual-zone automatic climate control system, and a Harman Kardon premium audio system. When it comes to picking out the right car for you, it’s often a compromise between which amenities you want and which you can afford. The price range for the 2018 Subaru Forester is quite large, from $22,000 to $33,000, depending on which amenities mean the most to you. Even with the most basic 2.5i, the voice dynamics control (VDC), antilock braking system (ABS), rear-vision camera and knee airbags will help keep you or your loved one safe while driving. For a bit more of a luxury, the 2.5i Touring provides extended comfort with its improved climate control system and heated steering wheel. Or if you’re somewhere in between, the Premium and Limited models are good options as well. Overall, the 2018 Subaru Forester was rated an 8.2 out of 10 by Consumer Reports, making it #8 this year in compact SUVs and a good option for your household. In terms of safety, the rating for this car was a 9.2 – with a score that high, it’s hard to go wrong with this car. With Subarus gaining in popularity too, the company is changing its look to be more aesthetically pleasing to more and more drivers. With all the improvements Subaru has been making in its cars in the past few years, it’s worth at least taking this car out for a test drive.